The standard method for quantifying antenna performance is Gain. 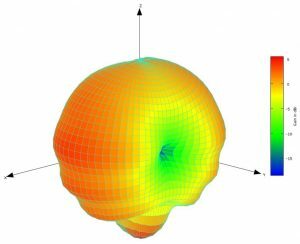 An antenna’s gain is so fundamental to its evaluation, that we have written several tutorials on the subject in our educational section. Gain is a function of direction, meaning that gain is usually different in various directions. Varying gains in different directions, create an antenna gain pattern, or radiation pattern. This pattern tells us the preferred, or best directions, for energy from your antenna. Oh, and it tells us its poor directions too! We test gain by illuminating your antenna (AUT, or Antenna Under Test) with a frequency swept RF signal from one of our anechoic chamber “source antennas”. Then we measure your AUT’s gain (in dB isotropic / dBi) via the substitution method. The substitution method involves setting up our known calibrated laboratory reference antenna over a radiated path in the chamber, then normalizing (or “zeroing”) that path loss to 0 dB. Then we exchange our reference antenna for your Antenna Under Test (AUT), and re-measure the path gain/loss changes relative to the previously normalized reference path. 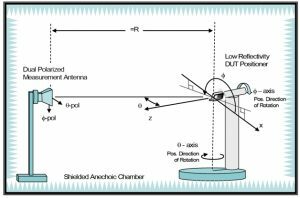 By simply adding our reference antenna’s calibrated gain (in dBi) to these path change measurements, we determine your antenna gain in dBi. In other words, your antenna will have gain higher, the same, or lower than our reference antenna. 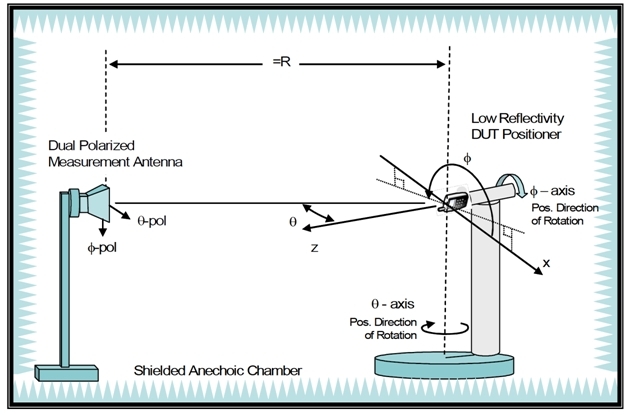 Our inventory of reference antennas are chosen to span wide frequency ranges. 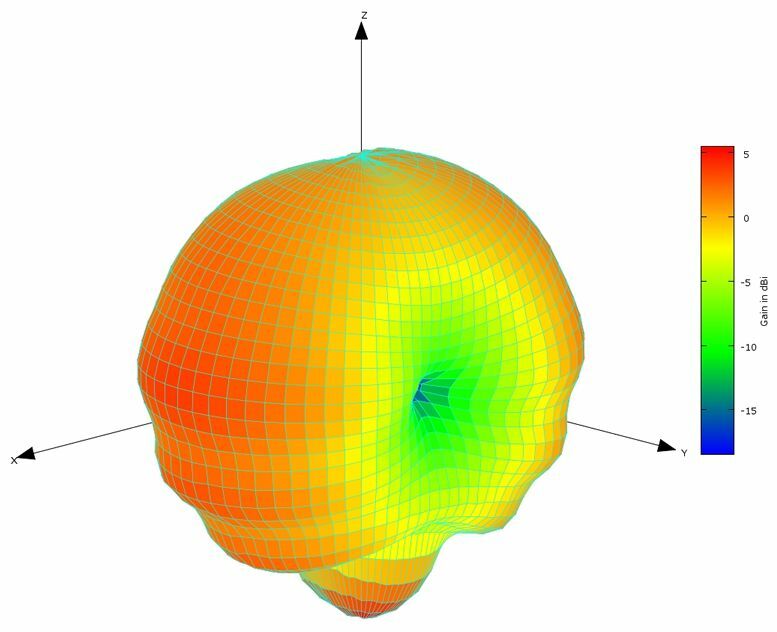 For example, using our calibrated 300 MHz to 30 GHz reference horn allows us to measure your antenna’s gain over its entire operating range, in hundreds of physical directions, in one test run. Tests DO NOT have to be repeated at each individual frequency, as with tuned dipole substitution. Even though this reference dipole antenna has a sophisticated tunable balun designed to decouple the feed line, dipoles are not the perfect reference antenna that many people think they are! When measured in a “Satimo” type arch, this feed line radiation would be missed in the chamber’s “blind spot” (at the base of the arch). This 3D spherical pattern is measured in 5 degree increments, and has 2700 grid points (test directions). Perhaps you can see why it is foolish to think that dipoles have exactly 2.14 dBi of gain! It is hard to find even a few directions in the real pattern that have 2.14 dBi gain! Surprises like this are one of the many reasons why real antennas need a full evaluation.